The transformer gallery is the obvious place to start looking for transformers. There are a number of ways in which transformers here can be located. Transformer categories are a good starting point from which to explore the transformer list. Transformers are grouped in categories to help find a transformer relevant to the problem at hand. Notice that each category lists the number of transformers that it contains! Simply click on the expand button to show all transformers within a particular category. 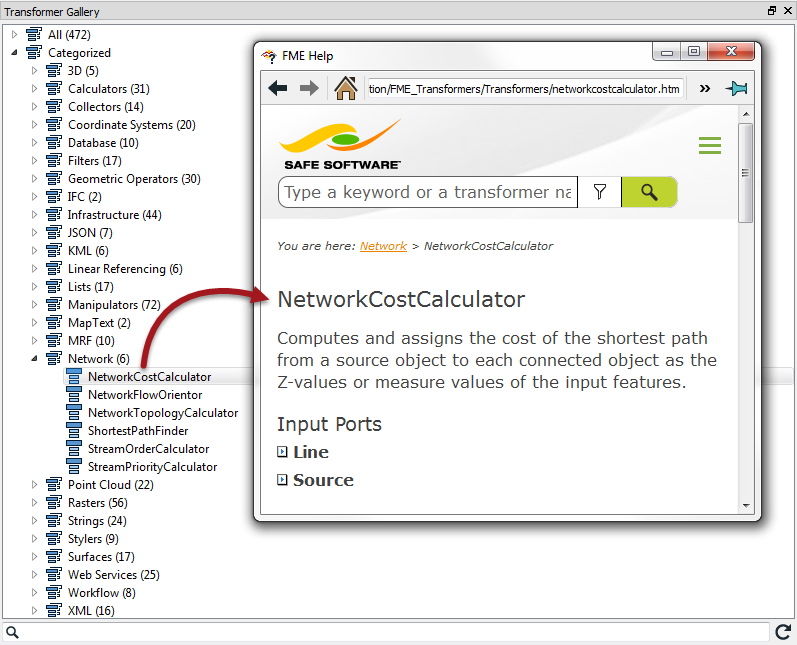 The FME Workbench Help tool displays information about transformers. Simply click on a transformer and press the F1 key to open the help dialog. This tool is linked to FME Workbench so that a transformer selected (in the gallery or on the canvas) triggers content to display in the Help tool. In FME2016.1 the help window was altered to not update automatically when a new object is clicked on. But in 2016.1.1 this behavior was returned, along with the embedded help window! Another useful - and printable - piece of documentation is the FME Transformer Reference Guide.